Attendance at the Charity Ball dance was down this year, with around 450 tickets sold instead of a usual 700. This significant drop in attendance may have come, in part, as a result of new school dance rules. Planned by a committee of students, parents, and administrators, the new rules aim to encourage more appropriate conduct at school dances, beginning with the Charity Ball on February 15. Students who purchased tickets prior to the dance received a slip of paper outlining expected behavior and dress code. It was also made clear that a failure to follow these guidelines would result in warnings and then possible ejection from the dance. Despite the good intentions, many students took issue with the new rules. The most contentious proved to be the required mid-thigh dress length for girls and the prohibition of provocative dance moves like grinding. “I can’t believe they wouldn’t let me twerk anymore,” said West senior Ricky Gerber. East junior Brandon Unger also felt strongly about these regulations. “It’s horrible, ridiculous,” he said. East sophomore Bella Jubran agreed. “It’s a high school, we need to let loose sometimes. I understand it’s uncomfortable for some people, but it’s just how we have fun. Some people choose to dance that way,” she said. Others held just the opposite opinion. Additional changes to the dance included hiring a professional DJ, adding lighting to surround the field house, and inviting parent chaperones to supervise the event. Indeed, several parents volunteered to maintain order. Schlass thought the same. “In 15 years, this is one of the best dances we’ve had. I think people are making good choices,” he said. 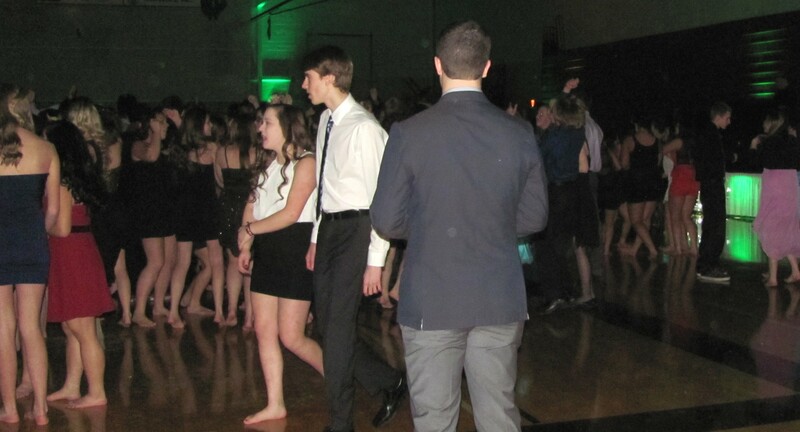 Only two students were asked to leave the dance due to behavioral incidents. Students attending the Charity Ball received this letter outlining new behavior expectations.